YOU GUYS! YOU GUYS! YOU GUYS! 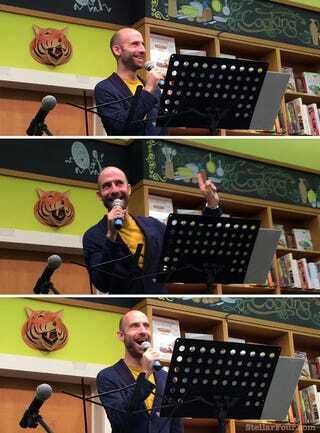 I was five feet away from the voice of Night Vale and it was glorious! Cecil Baldwin, Mara Wilson (as the Faceless Old Woman Who Secretly Lives In Your Home), and creator Joseph Fink performed an extended version of an upcoming episode two days ago in San Francisco this week. One of the best parts of the whole thing was Cecil's facial expressions totally matched up with what I imagined, adorable and slightly crazy. The other fans were even more excited that I was. People actually cooed during the performance. A good number of people cosplayed. I loved this little girl's glow cloud. The show was in such high demand, the 275 tickets sold out in two seconds online. That went so well, they decided to host a second showing right afterward and that sold out almost instantaneously also. I wanted to score an awesome seat to the first performance, I arrived 3.5 hours early and there was already a line ahead of me. It was totally worth it. If you get the chance to see a live show, go. If not, I have more photos of cosplay, Mara Wilson, and Joseph Fink here.